"I can not travel by the boat. I will be very, very sick. Let's return", cried one of our friend. 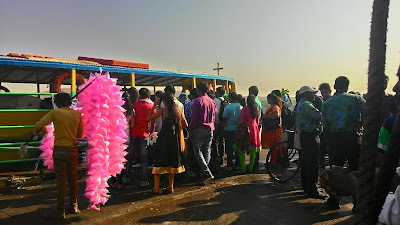 We were standing at the Gorai Jetty but she did not allow us to buy the boat-tickets. 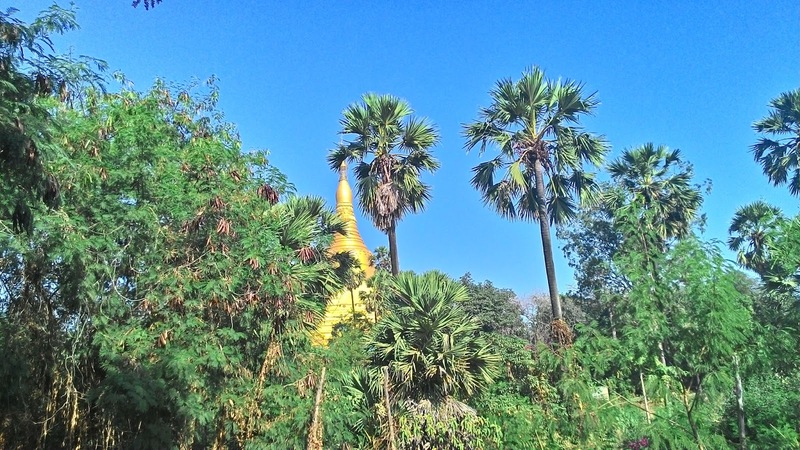 We returned satisfying ourselves, with just the glimpse of the majestic Global Vipassana Pagoda. The impact of that golden glimpse was so strong that I vowed to visit it at the earliest. That was exactly an year ago, 1st January 2015. Since then, I was craving to visit that grand Golden Pagoda. We were at my sister's home in Borivali to celebrate the new year. My sister suggested, "Let's go to Ganpati Mandir and begin our new year auspiciously with God's blessings". I added, "Yes, let's go to Global Vipassana Pagoda and pray". My nephew finalized with "You both want God's blessings. 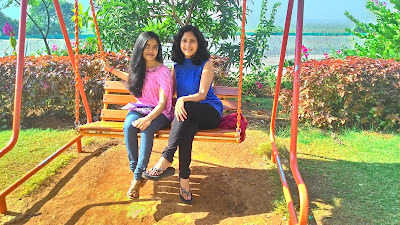 I and Aditai want boat-ride, Mamma and Papa want all of us to be happy. So let's go to the Global Pagoda by boat". That's Indian Family's Single Kid-Impact , which finally decided our destination. January 1st, 2016, We reached the Gorai jetty by car. Purchased the tickets and sat in a boat to reach the other shore, where the pagoda shines in it's golden glory. 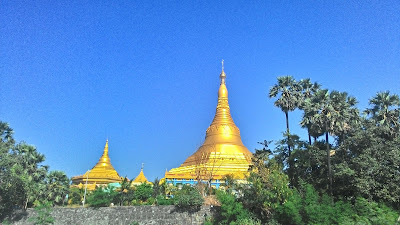 The Global Vipassana Pagoda is a Meditation Center near Borivli-Gorai in Mumbai. It was inaugurated by the President of India Pratibhatai Patil in 2009. The pagoda serves as a monument of peace and harmony. The shape of the pagoda is a copy of the Shwedagon Pagoda ( Golden Pagoda ) in Yangon, Myanmar. It is built with combination of both ancient and modern Indian technology to maintain it in mint condition. The swaying coconut trees greeted us at the entrance of Global Vipassana Pagoda. 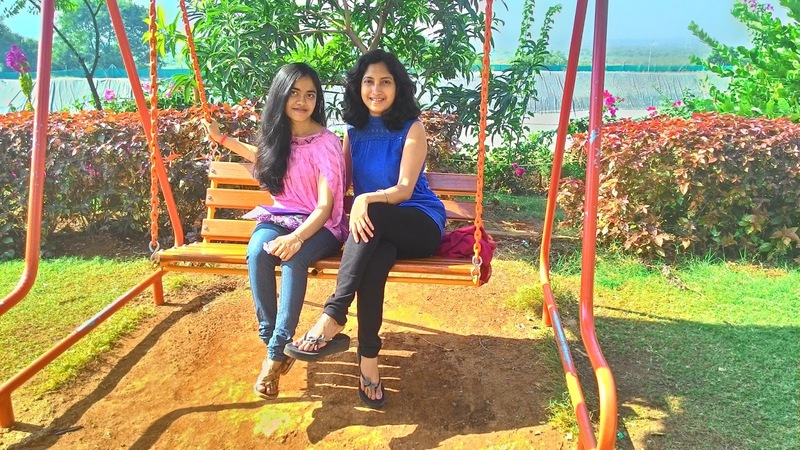 At the shore, most of the picnickers took right turn( towards Essel World ), while our family turned to left on the High-way to spirituality, towards the serenity. The very first visual impact of Global Pagoda is spectacularly mind-blowing. All of us elders folded our hands, in reverence for the 'Namaskaar'. The children imitated us and rushed towards the Nagara-sqaure. Global Vipassana Pagoda's center comprises of the world's largest stone dome built without any supporting pillars. A very large meditation hall is located inside the pagoda. It has a capacity to accommodate over 8000 people for the Vipassana meditation. 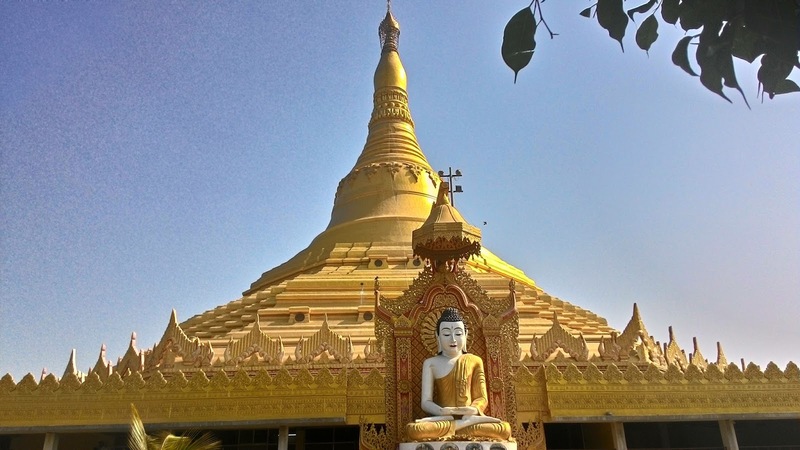 Here 10-day vipassana meditation courses are held free of charge at the meditation center situated at the Global Vipassana Pagoda complex. The pagoda has in all three sub-domes. 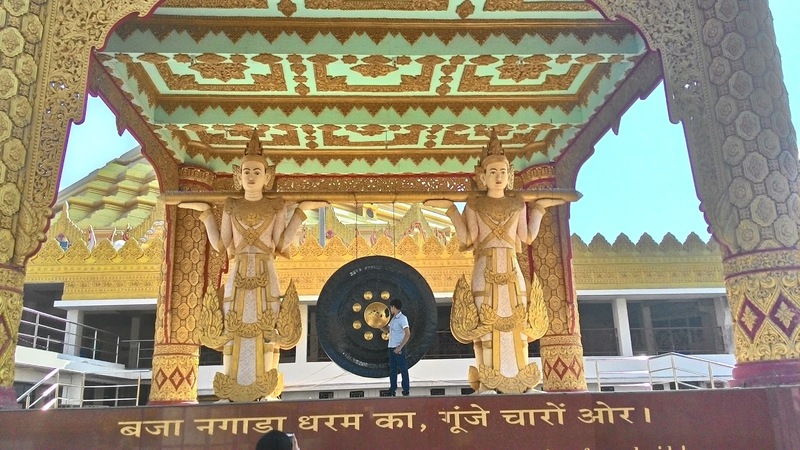 The first and largest dome is the world's largest structure containing relics of the Buddha. 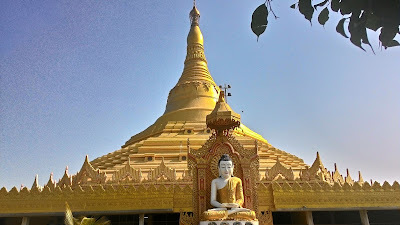 The Global Vipassana Pagoda complex has, Pagoda dome containing relics of Gautam Buddha, Vipassana meditation centre Dhamma Pattana ,Two smaller pagodas on the north and south side, Library, study rooms and Administration building. The south pagoda contains 108 meditation cells for use by Vipassana students taking a meditation course at the adjoining meditation center. The lovely garden full of assorted trees adds to the scenic beauty of Global Pagoda. The spacious restaurant serves delicious snacks / meals at reasonable rates. 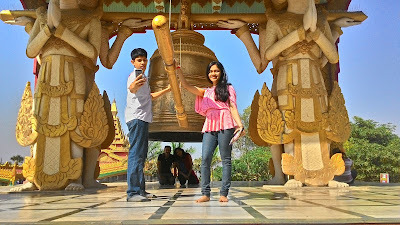 Our new year began with peaceful meditation at the Global Vipassana Pagoda and the children were greatly impacted with our prosperous culture, tradition and spirituality. Well wriiten and nice photos. 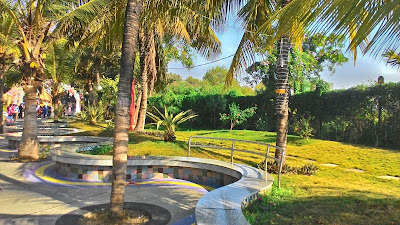 I was there a few years back and I really liked the serene place. Good Morning, Vasudevan. Welcome to 'Spirit Of Mumbai'. 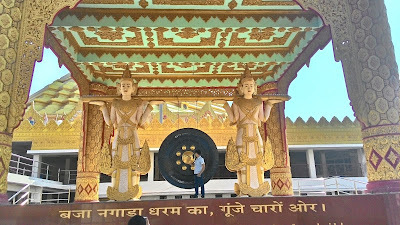 This Global Vipassana Pagoda needs at least 4 hours to be appreciated in totality. I wish, we could have stayed there for many hours. Wow, it looks huge. Must be a great pace to immerse in meditation. I have lived for 10 years just across the jetty. It is sad I never set my steps on that serene spot. Thank you for bringing across an inside peek. Very refreshing images. You said It, Umashankar. WE are living in Mumbai , for generations and still keep on procrastinating to admire the scenic wonders of our own city. I hope you visit it soon and enjoy it.